Explore the pristine wilderness of Assam in North East India on this 8-day cruise across the Brahmaputra River. Visit Manas National Park and Kaziranga National Park. Sight rhinoceroses and elephants against the backdrop of Himalayas on this Indian adventure! 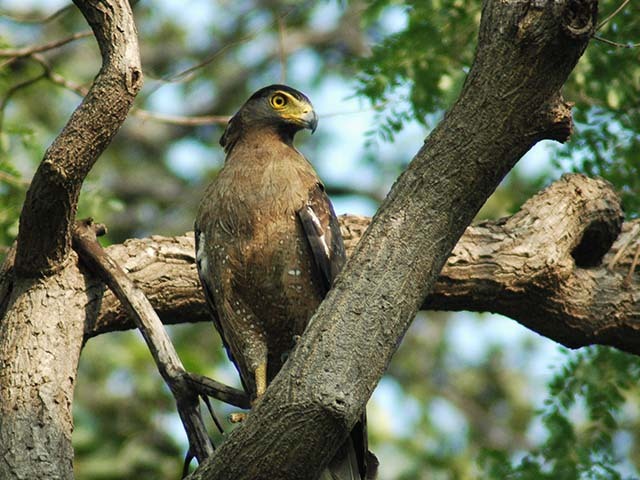 Spot some of Manas Park's 380 bird species. Your Northeast India wildlife tour starts at Guwahati airport or at Samdrup Jonghkar (Bhutan border) where you will be met by our representative and driven for about four hours to Manas National Park. You will be assisted in checking in to Bansbari Lodge here. The Manas National Park and Sanctuary is a UNESCO Natural World Heritage site in Assam, India. 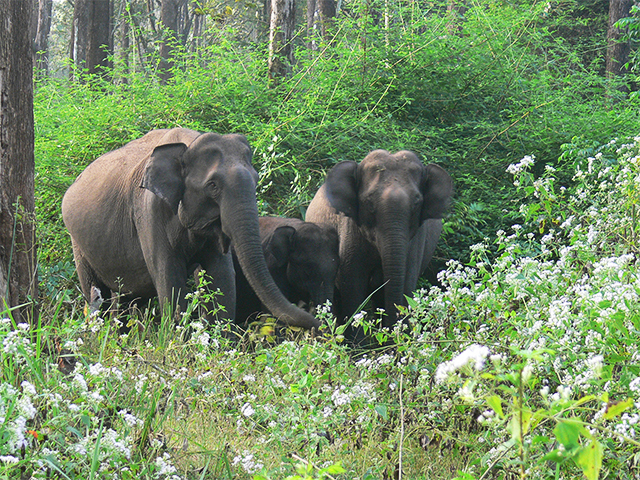 It is also a Project Tiger Reserve, an elephant reserve, and a biosphere reserve. Located in the Himalayan foothills, it covers an area of 950 sq km (square kilometer) and is continuous with the Royal Manas National Park in Bhutan. Manas River is a major tributary of the Brahmaputra River, which passes through the heart of the national park. Manas is known for its rare and endangered endemic wildlife, such as the Assam Roofed Turtle, Hispid Hare, Golden Langur, and Pygmy Hog. Bansbari Lodge is situated at the entrance of Manas National Park, with tea gardens on one side and the Himalayan foothills on the other. It has 16 large en suite rooms that are simply yet comfortably furnished. The chef serves delicious home-cooked meals of local Assamese, North Indian, Chinese, and Continental origins. Go on an early morning elephant safari through the grassland of Manas National Park, which harbours several different species of deer and monkeys. Spot some of the Park’s 380 different species of birds including the rare Bengal Florican and the Great Hornbill. Return to the lodge for breakfast and later, you'll be going for a walk through a local village exploring a tea garden nearby, and see traditional Bodo tribal handweaving. If time permits, see working Elephants bathing in the nearby Beki River and then head to see the sun set over the Manas River. 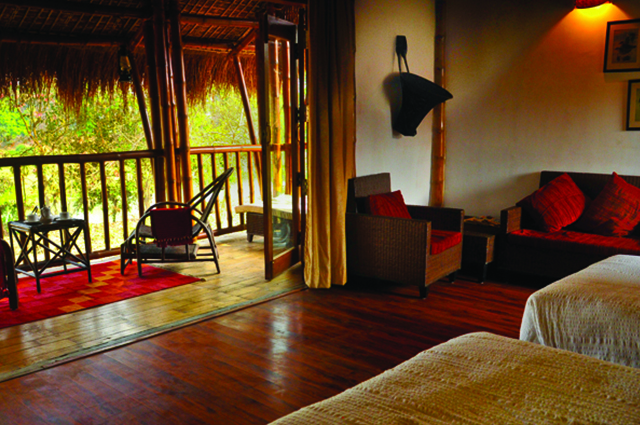 Return to the lodge at dusk and look for wildlife en route, perhaps a Wild Buffalo, Wild Elephant, and if lucky, you can also spot a Tiger. After dinner, enjoy watching a tribal dance around the camp fire. You have a relaxing day today that involves a drive to Guwahati to board the ABN Charaidew near Saraighat Bridge to start your Assam wildlife cruise. The ABN Charaidew is a 38m long twin-engined steel hulled passenger boat. The boat hosts ten twin-bedded and two double bedded cabins with en-suite facilities. All cabin accommodation is on the upper deck, as is a bar and saloon opening onto a front deck. On the lower deck is a dining room with full length glass doors on either side. A large top sundeck offers additional comfortable open-air seating in shade or sun. Specially woven local handloom fabrics and comfortable cane sofas and chairs, all contribute to the attractive decor. The boat cruises downstream to an overnight stop close to the south bank village of Viajynagar tonight. Start the day by exploring a quaint river-side village on foot. Then cruise upstream to the lively town of Sualkuchi, famous for silk weaving. See the whole process of silk manufacturing here, from cocoon to spinning to dyeing and finally to handweaving into exquisite saris and dress lengths. Later, drive to Hajo, a place sacred to Hindus, Muslims, and Buddhists. Visit a hilltop Muslim shrine with far-reaching views over the surrounding rural landscape, as well as a simple Hindu temple with a frieze of elephants, and a sacred tank full of great carp, catfish, and turtles. Return to the boat and cruise to an overnight mooring near the Saraighat War Memorial. 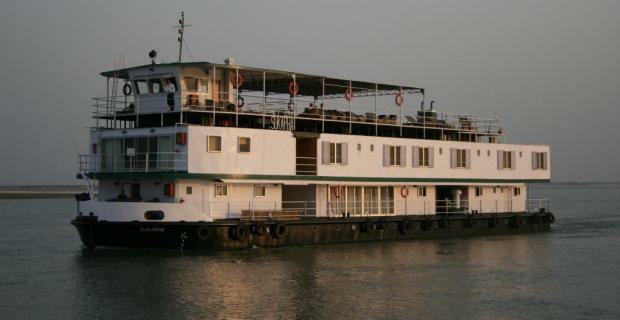 Cruising upstream, you disembark at Pandu docks and are taken on a short sightseeing tour of the city of Guwahati. Drive up Nilachal Hill to see the holy Kamakhya temple. With its tantric rites and animal sacrifice, the more squeamish may prefer to content themselves with the exterior. Visit a poignant Commonwealth War Graves cemetery as well as a nice shop selling local crafts. Take a country boat to the mid-stream Peacock Island to see its population of Golden Langur monkeys before re-embarking the ABN Charaidew and cruising for about an hour and a half upstream to Kurua on the north bank. Cruise upstream past jungle-covered hills, and turn into the Mayong River. Then cruise in your country boat for a kilometre or two to the road-head from where you drive to Pobitora Wildlife Sanctuary. This small park has a dense population of the Asian one-horned rhinoceros. Spot some of these amazing armored beasts on a jeep safari in Pobitora Wildlife Sanctuary. You'll leave on a five-hour drive to Kaziranga National Park, where you stay at the superbly situated and very comfortable Diphlu River Lodge, that looks across the Park. Kaziranga is a World Heritage Site and with a population of well over 1,500 One-horned Rhinoceroses, is the best place in the world to see these beasts. There are also good populations of Tigers, Wild Elephants, Sambars, Swamp Deer, Hog Deer, Wild Pigs, and many other species. Kaziranga was declared as a World Heritage Site by UNESCO in 1985 for its unique natural environment. Located at the edge of the Eastern Himalayan biodiversity hotspot, the Park has a high degree of species diversity as well as visibility. The Park was declared a Tiger Reserve in 2006 and boasts of the highest density of tigers among protected areas of the world. It also has large breeding populations of elephants and wild water buffalos. Rise at dawn and drive to Kaziranga’s Central Range for an early morning elephant safari in Kaziranga National Park, the best way to get really close to the rhino and other animals. Back at the lodge, walk through terraced tea gardens and past a Karbi tribal village. Also, visit a Mising tribal village that has distinctive houses raised on piles. In the afternoon, take a jeep safari in the Western Range of Kaziranga National Park and scan the wilderness from an observation tower. This is the last day of your Assam wildlife tour and it ends with a four-hour drive back to Guwahati Airport, or a two and a half-hour transfer to Jorhat airport.